From what I’ve heard, calories from French food don’t count today, so it really is the day to stuff yourself silly with croissants and bread and cheese and all things good and buttery! 2. Mix all the ingredients together in the same order as above. 4. Bake for 30-40 min. 5. Let cool down completely before serving. What’s your favourite French recipe? Do you celebrate Bastille Day? Yummy!!! It looks delicious 🙂 I do celebrate Bastille day ( as I am French) but I am working today so no time to cook 😦 but usually I like to bake something nice !! Have a nice day! Cake is the best way to celebrate! And yay for fellow Frenchies! My grandma always makes something similar to this but instead of cherries she uses rhubarb. Oh, that sounds heavenly! I have some rhubarb in the freezer, might give it a try next weekend! OHHHH I LOVE clafoutis! I might need to whip some of this up! 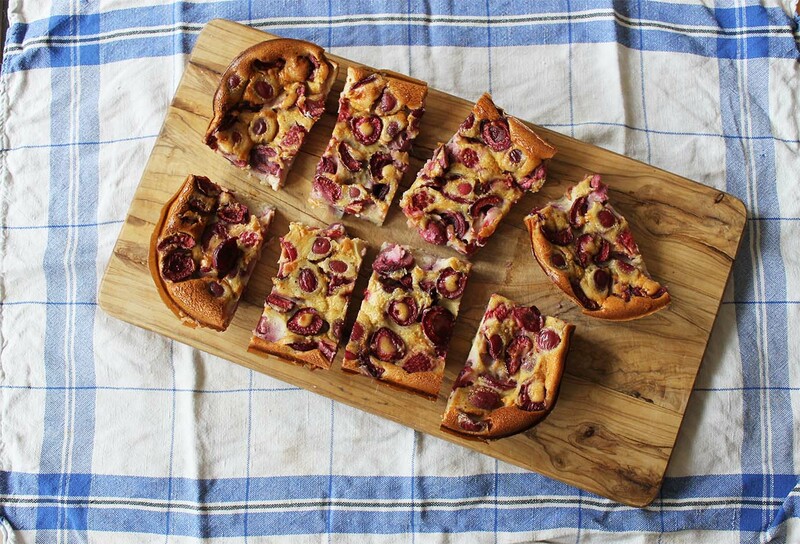 Cherries are so gorgeours at the moment I actually have to refrain myself from baking this over and over again! That looks really tasty! I wish I could bake. It’s really easy! If you can get your hands on some nice cherries, give it a go!